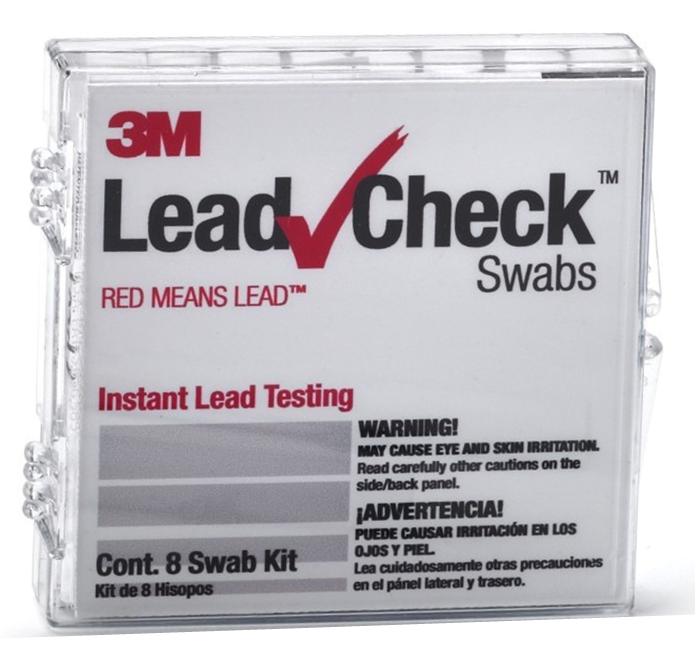 3M LeadCheck is the ONLY instant, EPA recognized lead detection test swab available on the market today. With the LeadCheck® lead test kit swab you will not find an easier way to confirm lead paint detection with this non-toxic, affordable, and disposable lead test kit. These test swabs provide and instant test for most surfaces, including wood, ferrous metal, (alloys that contain iron), drywall and plaster. The entire test should take 30 seconds or less and be completely accurate when testing is done on materials found to be viable by a EPA Certified Renovator. LeadCheck® Swabs provide a rapid, sensitive and specific test for leachable lead on any surface found to be viable by an EPA Certified Renovator. When lead is detected the LeadCheck® Swab and / or the surface being tested will turn PINK or RED on contact to confirm the presence of lead depending on the concentration of the lead. The use of this kit is not confined to EPA Certified Renovators except within the RRP program from the EPA. This item can be used by a homeowner to check their home as well, each kit includes instructions, 3M LeadCheck test verification card, and test swabs. We also have a video below to demonstrate the proper use of 3M LeadCheck lead test kit.